The Pieta, the wonderful Renaissance masterpiece by Michelangelo, and commissioned for the French cardinal, Jean de Billheres. It is the only known art piece signed by the artist and carved from Carrara marble. A mother’s wounded heart permanently carved in stone. Do you know of other wonderful mothers that made a positive impact in your own life? Jakesprinter’s SUNDAY POST theme is Wonderful. Here are some wonderful contributors below: Enjoy!! These are beautiful sculptures. I like that Mother Teresa one too. What a lovely surprise. 😉 Thank you for checking in during the Hurricane… your kind wishes were appreciated! 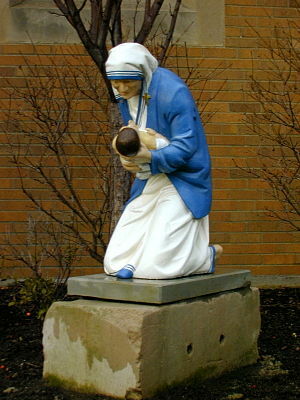 Beautiful sculpture and mother Teresa was realy a wonderful woman. Yes I know a wonderful mother though not famous, my mother. Amazing how cold rock can produce such warmth. Especially in these times, if everyone could do just one kindness in their own neighborhood, the world would be a better place. Phil, you sure have a great mind…”how cold rock can produce such warmth…” this is so true! Thanks for pointing it out and yes, kindness is the place to start to make our planet a better place. I AGREE!! Beautiful lighting on that close up of The Pieta. Truly a divine gift…have a wonderful day! These are not just wonderful, but deeply moving as well. They say when a child is born so is a mom. I love that.